SeaStar Solutions is pleased to announce that we have updated our very popular SeaStar and BayStar hydraulic steering helm pumps. The new helms will be a direct replacement for the existing products with additional product features. At this time the previous design will no longer be available. Orders will be automatically changed to reflect the new part number for all BayStar and SeaStar helms as well as steering kits utilizing these new helms. The addition of adjustable stainless steel O-ring fittings will simplify the installation process and will allow for simple reorientation of the fittings after installation. Pro helms will no longer be shipped with pre-installed fittings and will ship in the same manner as all of the other SeaStar helms. Identifying the Visual Differences. 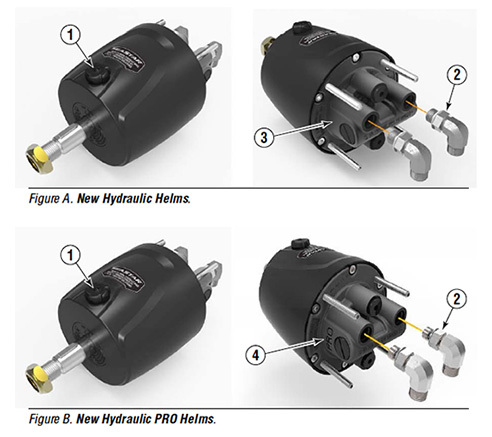 SeaStar Solutions has recently updated all helm pumps to use O-ring (ORB) type fittings. Before this update all helms used NPT fittings. The new fittings will simplify the installation process and will allow for simple reorientation of fittings after installation. Figures A and B below are intended to assist with identifying an NPT helm/fitting vs. an ORB helm/fitting. New ORB type helms are clearly marked with DO NOT USE NPT FITTINGS on the raised area at the rear of the helm. 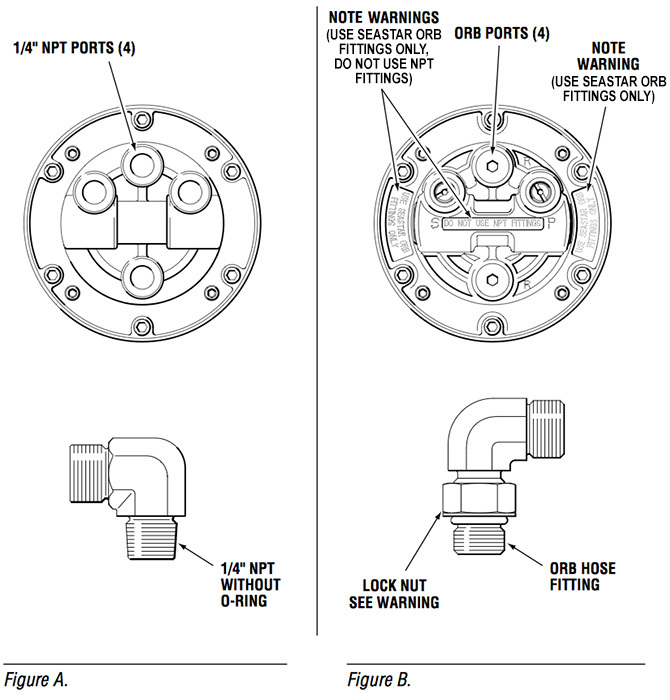 Do NOT use any NPT fitting or plug other than SeaStar Solutions ORB type fittings in the new helms (See figure B). Refer to the installation instructions included with your component for proper fitting installation. DO NOT use an NPT fitting into an ORB helm or vice versa, doing so may lead to irreparable damage to the helm pump, or, may result in loss of fluid or separation of components. Failure to adhere to this warning may result in loss of steering control, leading to possible ejection from vessel causing property damage, personal injury and/or death. SeaStar Solutions recommends that the hose and hose fittings are checked on a regular basis to ensure the safe operation of the steering system. How do I know if I have an ORB helm? All ORB helm pump part numbers end with -3. The rear valve of the helm has a clear stamp stating “DO NOT USE NPT FITTINGS”. Part number on decal (i.e. HH5271-3). Rear cover stamping shown above, See Figure B. Can an ORB helm be used with an NPT helm? Yes, no problem using the two helms together, be sure to order the correct fittings. NOTE: See fittings list for proper fittings. Are the hoses the same? Yes, there is NO change to hose fittings. NOTE: Only the helm side of the fitting has changed. Do I need to use sealant on the ORB fittings? No sealant of any kind should be used with our ORB Fittings. NOTE: O-ring seal, no need for pipe sealant. Is the oil fill port an ORB? NO, the oil fill remains an NPT thread. NOTE: No change to vent/non-vent caps. Has Hynautic or Capilano changed to ORB? No change. They remain at 1/4″ and 3/8” NPT at this time. NOTE: If changed they will become -3 with an advisory sent out. Can I use “other” manufacturers hoses with the ORB helm? Yes. The additional purchase of adapter kit, HF6012, will be required. CAUTION: SeaStar Solutions ONLY recommends the use of SeaStar/SeaStar PRO steering hose/tube to plumb our systems. Has BayStar changed to ORB? Yes. ALL BayStar, BayStar Plus, SeaStar and SeaStar PRO helms are now fitted with -5 ORB ports.